A multimedia-based report tracing the escape route of Javed, a young afghan man, back to his mother Ozra whom he hasn’t seen in eleven years. This project ended successfully on 2/5/2015 18:00! You will get a postcard-sized picture in connection with the report. You will get a printed version of the complete report. You will get a benefactor account on WHY ISSUE. No matter in what direction the magazine will develop, for you the contents will always stay free. Furthermore, you have the possibility of reading the reports before the official publication and will have exclusive access to more material from my travel. Furthermore, you will get a printed version of the complete report. You will receive special spices, brought home by me from Iran. Furthermore, you will get a printed version of the complete report as well as a benefactor account on WHY ISSUE (check CHF 100 reward to see what else is in it for you.). You will be invited to a big meal in the Galerie Parzelle403. The dish served will be one that I will have learnt to prepare on my journey. Furthermore, you will get a printed version of the complete report as well as a benefactor account on WHY ISSUE (check CHF 100 reward to see what else is in it for you.). You will receive a classy, AluDibond mounted print of a picture of your choice in format 30 cm x 20 cm. Furthermore, you will get a printed version of the complete report as well as a benefactor account on WHY ISSUE (check CHF 100 reward to see what else is in it for you.). You will receive a classy, AluDibond mounted print of a picture of your choice in format 45 cm x 30 cm. Furthermore, you will get a printed version of the complete report as well as a benefactor account on WHY ISSUE (check CHF 100 reward to see what else is in it for you.). You will receive a classy, AluDibond mounted print of a picture of your choice in format 60 cm x 40 cm. Furthermore, you will get a printed version of the complete report as well as a benefactor account on WHY ISSUE (check CHF 100 reward to see what else is in it for you.). You will have the possibility to charge me with a little assignment for my journey. I will interview a Beryuni cook in Isfahan, take a video recording of a street musician in Istanbul, or record the ambient sound of the market in Teheran, it’s all up to you. Furthermore, you will get a printed version of the complete report as well as a benefactor account on WHY ISSUE (check CHF 100 reward to see what else is in it for you.). You will be invited to a delicious and personal meal at my home. The dish will be one that I will have learnt to prepare on my journey. Furthermore, I will bring you a personal gift from Iran and offer to take a picture of you or of someone you love, for example your mother. Furthermore, you will get a printed version of the complete report as well as a benefactor account on WHY ISSUE (check CHF 100 reward to see what else is in it for you.). I am your personal photographer or cameraman for one day. You will receive a documentary in form of a short movie or a picture series of your concert, your party, your wedding, or whichever event you would like me to document. If you have got a set date, it would be preferable to ask me in advance whether I’m free. Furthermore, you will get a printed version of the complete report as well as a benefactor account on WHY ISSUE (check CHF 100 reward to see what else is in it for you.). I will produce a unique multimedia-based documentary of your event stretching over a period from one up to three days. For your festival, your wedding or whatever the event you would like to have documented is, I will create a website based on the WHY ISSUE environment, which you have unlimited access to and can be embedded into your personal website. If you have got a set date, it would be preferable to ask me in advance whether I’m free. Furthermore, you will get a printed version of the complete report as well as a benefactor account on WHY ISSUE (check CHF 100 reward to see what else is in it for you.). 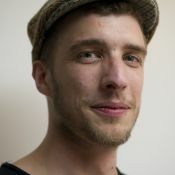 Simon Krieger is a photographer, a programmer and a student at Institute HyperWerk for Postindustrial Design. Combining those fields he is researching new ways of journalism. His Photographs won prizes at the International Photo Awards, the Prix de la Photographie Paris, the Moscow International Foto Awards and several others.